Learner-Centered Pedagogy encompasses broad methods of teaching that shift the focus of instruction from the teacher to the learner. Learner-centered practice acknowledges the learner voice, experience, and skills to reconstruct meaning from new information based on prior experience. 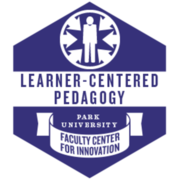 This badge acknowledges participation in a faculty learning community focused on understanding learner-center philosophies and strategies that can be helpful in creating a student-focused learning environment. Recipient participated synchronously or asynchronously in a Faculty Center for Innovation-sponsored learning community on the topic of Learner-Centered Pedagogy and has produced a written reflection on how the knowledge gained has affected his/her teaching, scholarship, or service.